A conquering vectorium led by Lord Gulgoth the Afflictor, the Tainted Sons are line-breakers and trench-fighters without compare. They are a warband as brutally direct as the Lord of Contagion who leads them, pouring scorn on those who concern themselves with such matters as danger or losses. The roar of massed bolter fire and the croak of glottal war cries fills the air as the Tainted Sons go to war. Their advance is methodical and direct, a slow but unstoppable hammer blow swung hard into the teeth of the foe. Under the yellowed eye of their lord, the Chaos Space Marines display terrifying fire discipline, picking a single, priority target and engulfing it in a merciless hail of shots. Only once their first mark is completely obliterated do the Tainted Sons shift their attention, eradicating their victims with an obsessive efficiency that borders on madness. This vectorium has lingered long in the warp, serving Mortarion faithfully during his wars within the Eye of Terror. Though they have been unleashed once more upon the worlds of realspace, Nurgle's empyric blessings still cling to these diseased traitors like a miasma. The ground curdles into churned filth beneath the Sons' feet, while unnatural spores and warp-tainted fumes thicken the air around them. Nothing natural can survive for long in the presence of these virulent Death Guard warriors. Undergrowth dissolves to blackened mulch while the flesh of foes begins to rot and break out in foul clusters of buboes. Gurgling their vectorium's motto, 'All will rot', the Tainted Sons mow down enemy battle-lines, sweep chamber to chamber through bunker complexes, and overrun the desperate defenders of starships and shrine fortresses alike. Their reputation for close-quarters brutality is well earned, and their tenacity is second only to their unnatural virulence. 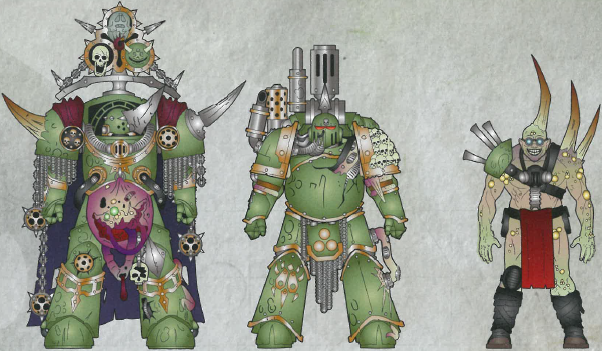 Lord Gulgoth's armour is bedecked with gruesome trophies and icons of devotion to Nurgle. The armour of all Plague Marines of the Tainted Sons bears the same hue: the sickly green of putrid flesh. Poxwalkers wear tattered scraps that hint at the varied lives they led before their corruption.